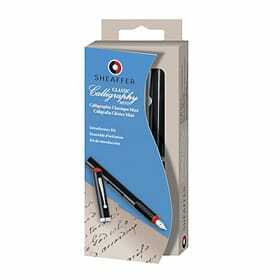 Hyegraph carries Sheaffer Brand Calligraphy Pens for people who like to be creative and have fun with their writing. Our selection in our store includes The Sheaffer Deluxe Kit, the Classic Calligraphy Mini and the Sheaffer Calligraphy Classic. Our Price for the Sheaffer Mini is $25.00, it comes with one pen and three ink colors. 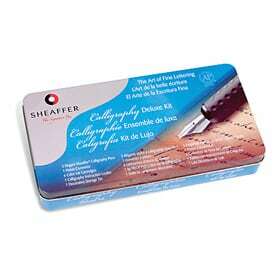 Our Sheaffer Classic Calligraphy set includes three pens and fourteen ink cartridges. The price is $45.0. 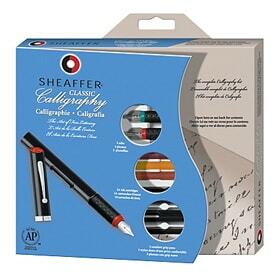 Our Deluxe Sheaffer Calligraphy Kit includes 3 Elegant Pens and 6 Color Ink Cartridges. Our Price is $55.00. Please stop by Hyegraph Invitations and Calligraphy located at 3 Embarcadero Center in San Francisco, CA. 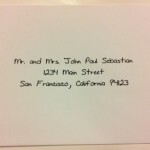 Street Level to pick up a pack of fun calligraphy pens write your special correspondence. 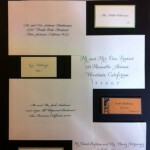 To see our stationery and products online please visit our Online Store.